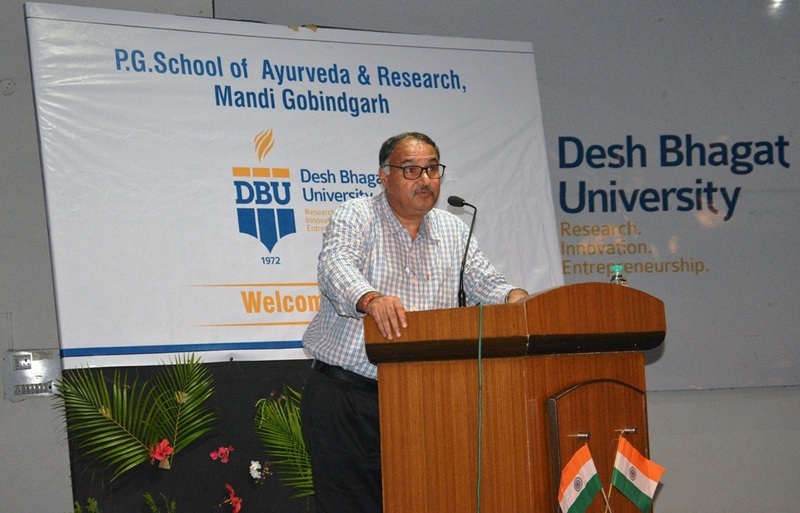 PG School of Ayurveda and Research University India organised a Guest Lecture on Ayurvedic treatment, research and its importance in the present scenario. Students of all classes from Ayurveda participated in it. Giving more details Director Faculty of Ayurveda & Research Dr. Kulbhushan briefed that Dr. Dinesh Katoch (Advisor, Ministry of AYUSH) was the key note speaker on this occasion. He lit the ceremonial lamp in front of Bhagwan Dhanwantri’s photograph and inaugurated the programme. While speaking on the occasion Dr. Katoch conveyed that Ayurveda is one of the world’s oldest holistic healing systems that developed thousands of years ago in our country. Although in the modern era, several advanced options are available for treatment but we can’t ignore the importance of Ayurveda, because only this system has the cure-all treatment for many critical diseases which can’t be cured by alternative therapies. Dr. Katoch stressed upon much more Development of Ayurveda- Government Policies, Strategies and Initiatives. He also shared his experiences about different fields of Ayurveda with the students. All the students evinced keen interest in the lecture and they asked relevant questions to which the learned speaker answered to their entire satisfaction. Deshbhagatuniversity Pro Chancellor Ms. Tajinder Kaur thanked Dr. Katoch for sharing his views and experiences. She said that the students were highly motivated by his inspirational words and also developed a new sense of approach towards Ayurveda. Chancellor Dr. Zora Singh appreciated the initiative of Ayurveda Faculty and urged the Ayurveda students to promote Ayurveda among maximum number of people. Vice Chancellor Dr. Virinder Singh expressed his views that it will prove quite useful for the students and faculty members as well. Dr. Smita Johar, Dr. H.S. Benipal and faculty members were also present on this occasion.